TimberTech Decking designers know that creating decks goes way beyond the traditional square one level spaces of yesteryear. With all of the TimberTech Decking lines, railing systems, and accessories your deck can be completely unique and timeless. Just like indoor design trends, landscaping and outdoor spaces have become one of the top selling points for a home. 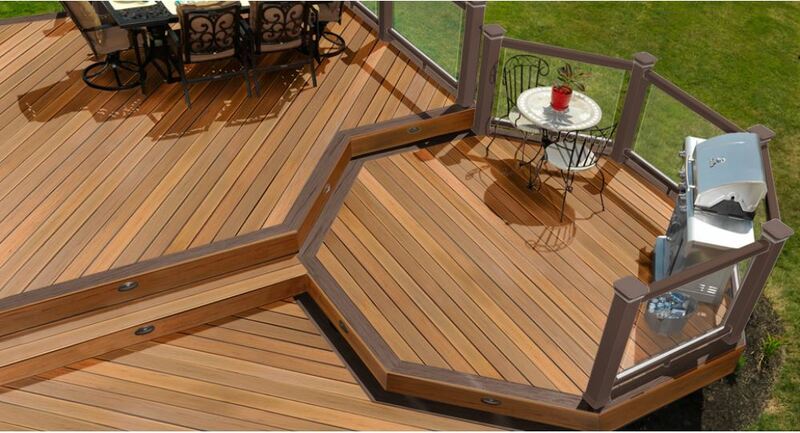 TimberTech Decking will bring lasting value to your home while giving it style and elegance. TimberTech Decking is proud to share with you their decking lines, railing systems, and accessories that fit today’s trends. Here are a few new ideas that you will be seeing this Summer! Applying a different colored trim around the perimeter of your TimberTech Deck is not an entirely new concept but is sure to take off in 2019. To capture the true essence of picture framing the key is contrast! For instance, if your main TimberTech Deck is dark in color a significantly lighter shade will outline the perimeter or vice versa. Homeowners who have multi-level TimberTech Decks are applying this technique to give added dramatic dimension to their masterpieces. By looking at all of the different colors available in deck boards you can begin pairing them together to get an idea of what this might look like. Although it may take some getting used to, creating a tri colored TimberTech Deck will make a statement like none other. There are two ways to go with this application. You can either choose three shades within the same palette which will present the strategy but in a subtler way. On the other hand, you can choose three totally contrasting shades from different color palettes. This is extremely dramatic but can be very striking. Cable Railing: Give your TimberTech Deck a modern or industrial look with cable railing. Modern aesthetics meet low maintenance. Coupled with the sleek continuous top rail the clean lines of the cable make it seem like there is no railing at all. Glass Panels: Whether you have a view of the ocean or of a landscaped backyard using glass panels gives you an unobstructed view that you can’t get with any other railing system. Enclose your TimbertTech Deck with glass for an unprecedented and unique look. To take this look to the next level TimberTech Decking offer the glass railing systems with or without handrails for an even more infinity vibe. When you use TimberTech Decking and get creative with the design of your deck it will look like it came out of a magazine. Splitting your TimberTech Deck is sure to be a big hit this year so get a jump on it! Homeowners, builders, contractors, and deck builders are quickly realizing that add split levels to TimberTech Decks is a great way to handle oddly shaped or sloping yards. Incorporating steps and intricate railings you can easily connect several platforms for an organized “uniform” look. Drawing out your ideas for a split level TimberTech Deck can help you envision the layout. These are just a few of the up and coming trends for TimberTech Decking this year! TimberTech Decking can help you make a complex design idea come to life or provide you with the materials to make a smaller quainter outdoor living space. Either way go with TimberTech Decking to ensure the quality and durability so that you can enjoy your deck for years to come!